Numerology the old-fashioned way – a complete listing of each number in your chart. Make Numerology Charts for yourself, your friends and family, or anyone else! Our Numerology Chart Calculator lists every number and cycle in your chart, including several unique to Decoz. The algorithms are based on established Pythagorean numerology and include double-digit numbers, Karmic Debt numbers, and Master numbers. 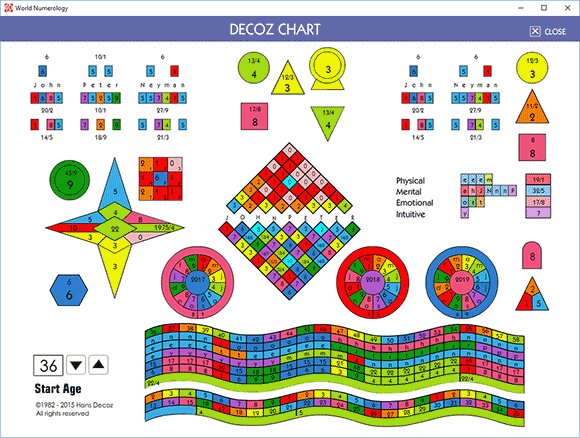 The Decoz Color Chart was first developed by Master Numerologist Hans Decoz in 1982. This revolutionary charting system artistically displays your most relevant numbers and cycles in one easy-to-oversee chart. Make as many as you wish. 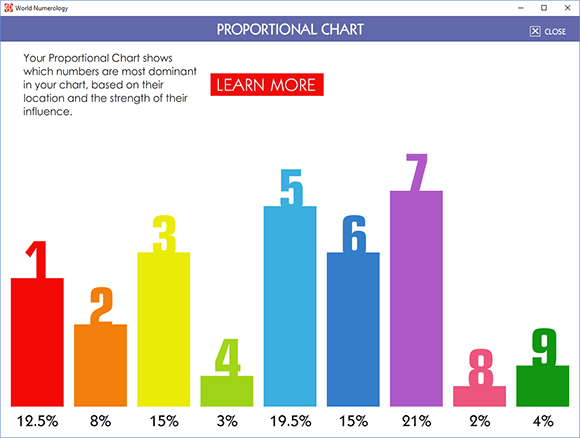 The Proportional Numerology Chart shows the most dominant numbers in your chart based on location and frequency. For example, if you have a 7 Life Path, but the 5 appears three times among your other core numbers, the 5 will be more dominant and is considered your true numerology number.